Kody's Dividends: Why Not Start Investing Today? If you're anything like me, you probably enjoy the idea of your money working for you. After all, it takes money to live. 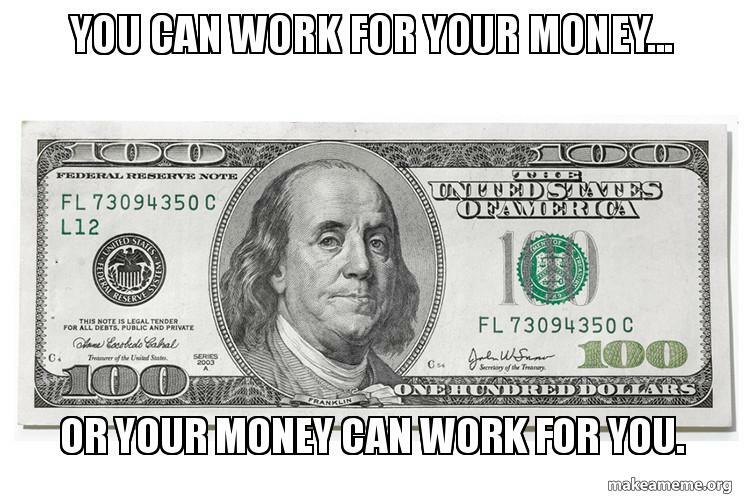 If your money isn't working for you, you must work for your money. But you may be wondering what I mean when I talk about making your money work for you. That serves as the basis of what we'll be outlining today. When I refer to making your money work for you, I am referring to the keyword in this post being "investing." Quite simply, investing is the act of expending money with the expectation of that money you expended growing in purchasing power over time. In other words, investing is the act of delayed gratification. When you adopt the mindset of delayed gratification, you are adopting the mindset that by not spending this dollar I have today, I can grow this dollar to 2 dollars 10 years from now. This capital that you earned through time and patience can be used to fund your lifestyle, and in turn, it can be used to provide you the freedom that many workers yearn for. As I mentioned not long ago, the path to becoming an equity investor has never been easier. As such, it deeply saddens me that 46% of Americans don't own stocks. I liken the US stock market as equivalent to the "Wal-Mart Supercenter" of investing. The US stock market has exposure to every industry in the US economy to diversify your portfolio, from utilities, to energy companies, to pharma companies, to media companies, to railroad companies, financial services companies, and so much more. Now, there are many ways to invest, including real estate, and I don't want to dissuade anyone from pursuing those investment options, but my personal philosophy is why go through the hassle of being a landlord when real estate investment trusts (REITs) like Realty Income (O) can handle all the headaches that go along with being a landlord on your behalf as an investor in their business. As anyone that has followed this blog a bit can guess, I am a dyed in the wool dividend growth investor. This short piece about dividends by Morgan Stanley concisely illustrates precisely why I am a dividend growth investor. Companies have different ways to manipulate earnings through accounting, which means that dividend growth investing is a way for companies to "show me" the success of their business, and not just tell you about it. Secondly, dividend paying stocks tend to be less volatile in bear markets, meaning that their stock price is less likely to be as negatively impacted by a downturn in the stock market. And when done right, investors in these dividend paying companies continue to be paid growing dividends through these tough times. This is very helpful to many investors psychologically as I certainly wouldn't want to part with a company that continues to pay me a growing dividend even through a recessionary period. Moreover, because management generally takes paying sustainable dividends seriously, it forces them to be more discerning about how they reinvest their profits back into the business with the intent of increasing profits. Lastly, management can't screw up what it doesn't control. If a company sends half of its profits to an investor, the investor now has the responsibility to decide how they should allocate their capital. They can use it to pay bills, save it, or reinvest it into another dividend paying company. But What About The Market Near All-Time Highs? As everyone is probably aware, the market has been constantly hitting or testing new highs. With that said, investors and wannabe investors would be wise to remember the adage that "time in the market beats timing the market." There have been countless times since this bull market began in 2009 when the investor community believed that we would enter another recession and stocks would soon plummet. One such instance that I remember was when major credit rating agencies downgraded the debt of the US government. However, as we know, the market continued to soar to all time highs, and these news events look completely irrelevant now looking back. As Dividend Sensei over at SeekingAlpha puts it, the market is constantly climbing a wall of worry. Investors that exited the market years ago when there was concern the market would crash have missed out on serious gains, which goes to show that nobody can accurately predict exactly when the market will crash. It's been proven that the typical equity investor significantly under-performs the market. This isn't because investors lack in the intelligence to perform in line with the market or outperform the market, rather it comes mostly from a lack of discipline and emotional intelligence. One can begin to create a mostly passive dividend income stream today by selecting dividend growth companies that are trading at fair to better valuations. There are nearly 900 dividend paying companies that have increased their dividends for at least the past 5 years that you are free to skim through for idea generation for investing purposes. The longer a company's dividend growth streak continues, the more indicative it is that the company has strong fundamentals (i.e. wide business moat, strong balance sheet). As dividend growth investors, we are looking for such companies to grow our dividend income, and allow our money to work for us, so we don't have to work for our money. As always, please remember that I encourage investors to do their own due diligence, and the mention of any companies in this article should not be construed as an endorsement to invest in them. What is your preferred method of investing? 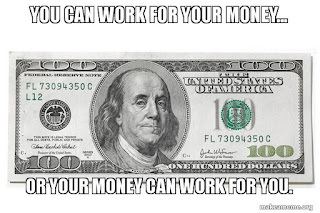 How hard is your money working for you?